We read about them and see them on the news, and let’s admit it, not many of us like them. I am of course talking about political parties, but though we all moan about them, just what other alternative do we have? Well we have a very good one in Lincolnshire in the form of the Lincolnshire Independents, who have pledged to put Lincolnshire First! It was launched in July 2008 as an attempt to re-align politics in Lincolnshire and give a real alternative to the voters. 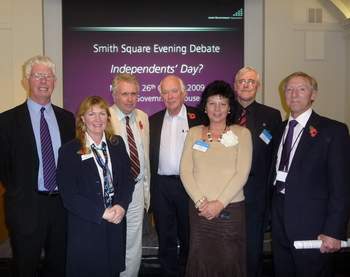 Representing Lincolnshire Independents at a national Executive meeting in London this year (2009), Marianne Overton met the well known writer, broadcaster and successful Independent MP Martin Bell, who is helping to campaign for more Independent voices in Parliament. It is the hope of the Lincolnshire Independents to re-write the stagnant political landscape in Lincolnshire and breath fresh life and hope into our communities. As their statement so clearly expresses, Lincolnshire Independents are the ones who research issues carefully, speak up and vote freely for what is right for the people of Lincolnshire. Lincolnshire Independents seek to represent their communities directly of which, naturally close communication is important. Consultation about local needs is, they stress, more important than party politics handed down from a distant central office. As is far too often, political parties control their MP’s with the Party Whip and block voting, which is effective in "gagging" our local representatives who have, of course, party allegiances and, all this has resulted in the fiasco we are now in with poor decisions being made in this county. It is important to note that Lincolnshire Independents are elected on their own merit and are more closely in touch with their communities. And unlike distant political parties intent on self-gain Lincolnshire Independents are more interested in what their electorate is seeking and that forms their manifesto. Their first loyalty is to the people they represent, regardless of party politics. It is in this light that they believe that all local councillors should be independent with local voters being their only masters and local improvements their main aim. “This is an exciting time in Lincolnshire – a new political force is emerging.” said Marianne Overton, Chairman of the new movement. Mark Horn, Campaign Director of Lincolnshire Independents – Lincolnshire First!, said: “There is tremendous opportunity for a new form of politics – District, County, Parliamentary, and indeed, Europe. We will be looking to fight for the people of Lincolnshire at every level”. Horn stated: “The old political parties are failing because they do not represent the people of Lincolnshire. We need to bring more people into politics – people from the private sector, young people, and people from all backgrounds.